Timing the debuts of top prospects is essential for MLB teams. No club wants to expose a player to top competition before he's ready, but keeping a player in the minors when he could be contributing at the big league level is hardly appealing either. It's a balancing act. Though a player's development generally determines his timeline to the Major Leagues, service time is undeniably a consideration. MLB teams can obtain an extra year of control from a player by delaying his debut and they can decrease his chances of qualifying for an additional year of arbitration with enough patience. Heavily-hyped prospects often have carefully-timed debuts, and Baseball America's recently-released list of the game's top 100 prospects features those currently generating the most buzz. 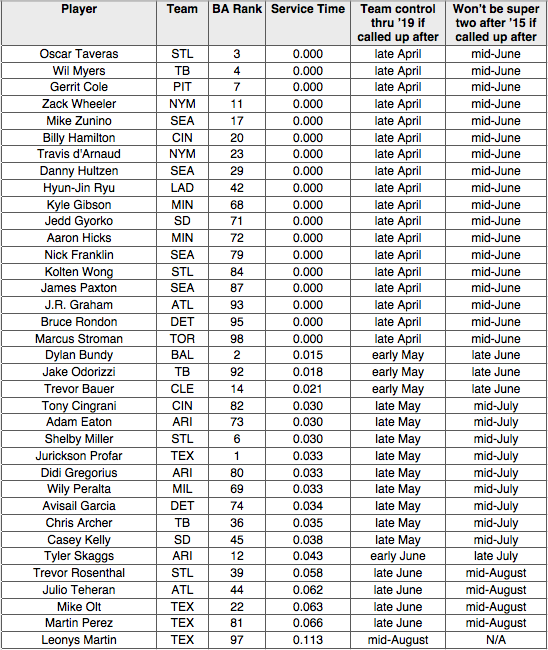 Of the 100 players on the list, 36 project to arrive in the Major Leagues in 2013, according to Baseball America. The chart below presents two key dates for each prospect who might make an impact this coming season. First, there's the approximate date on which the team can call the player up while keeping him under control for an extra year — through 2019. Next, there's the approximate date on which the team can call the player up without setting him up for super two status and a fourth trip through arbitration. In many cases — Hyun-Jin Ryu comes to mind — service time will not affect teams’ decisions. But keep this list in mind if you’re wondering why Wil Myers is still at Triple-A Durham midway through the first month of the season. This service time explanation is a modified version of a piece initially published at MLB Trade Rumors one year ago.